Samsung launches wireless in-ear headphones with built-in music player | What Hi-Fi? IconX wireless in-ear headphones include 4GB of storage so can store and play up to 1000 MP3 tracks. 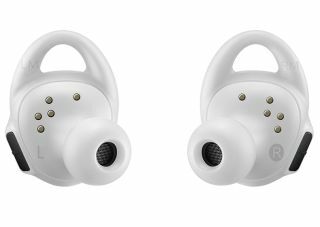 Samsung's IconX in-ear headphones have been designed with fitness in mind, offering a wealth of health-related technology as well as the ability to play music. The IconX is activated by placing the earbuds in the user's ears and are truly wireless earbuds, with no cables and Bluetooth capability. The IconXs aren't the first wireless in-ears we've seen (Onkyo's W800BTs have been floating about since IFA 2015), but they could be the first to hit the market. Other features include a music player with 4GB of storage built into the earphones, which Samsung says is enough to play up to 1000 MP3s. Control over your tunes is achieved either by tapping or swiping the earbuds. Battery life is a claimed three-and-a-half hours if you're listening through the music player. Recharging is possible via the pill-shaped case, which can store enough juice for an extra two charges. The Samsung IconX comes in three finishes (black, blue and white) and is expected to launch in July. As yet, there's been no word on UK pricing.